Stabilised Pavements Limited (SPL) is a specialist in-situ road recycling company, servicing construction, rehabilitation and maintenance of pavements working with highways clients, Local Authorities and Private companies throughout the UK. 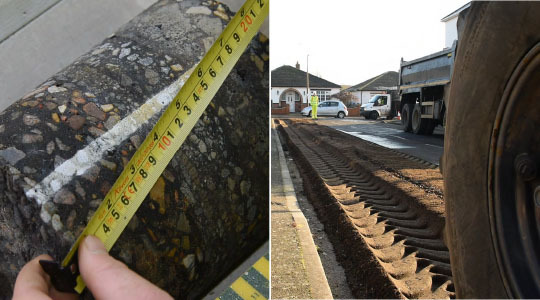 As the UK’s largest and most experienced, SPL provides a cost effective and quality assured approach for the structural repair and maintenance of a failing roads having worked at the forefront of road recycling and stabilisation for over two decades. The process takes place on-site to the highest standards using the best equipment available and the fastest turnaround. Specialist machines pulverise the existing road in-situ and then through the addition of a cementitious powder provide a deep structural repair with a 20 year design life. Whilst maximising re-use and recycling, the environmentally friendly integrated binder mixing process reduces dust operation and saves carbon emissions against traditional techniques, and is the preferred choice for many authorities who’s roads contain hazardous road tar. Operating independently SPL prides itself on delivering great customer service and a highly professional level of service and technical support. We deliver tried and tested solutions built on decades of highway experience, technical expertise, culture of innovation and a highly trained workforce operating state of the art plant and equipment. With a Design Life of 20 years, high recycled content and low carbon footprint, the treatment provides a cost effective and environmentally sustainable highway maintenance and pavement construction technique and is supported by SPL’s technical expertise and culture of innovation. The technique is increasingly employed to overcome challenges ranging from soft ground conditions through to rapid reconstruction and is based on extensive engineering expertise, technology and systems that ensure the highest standards of quality, occupational health, safety and environmental management. In-situ recycling has long played a vital Asset Management role for highway authorities and despite budgetary constraints, through early involvement and programming its wider use on both Trunk Roads and rural unclassified roads is increasing. When fulfilling the role of Principle Contractor, SPL engages with its supply chain partners for the provision of services around the recycling works; namely Traffic Management, Drainage and Civils, Tree Surgery, Surfacing and Line Marking.